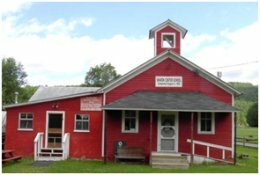 Visit Bwana Jim and his animal friends at the Old Red Schoolhouse Nature Center on 1989 Route 44 in Shinglehouse, Pennsylvania. Take a walk on the wild side and see exotic animals like alligators, armadillos, turkey vultures, and snakes. Hours by appointment only. Book Bwana Jim’s Wildlife Show – an enthusiastic, educational and witty show. 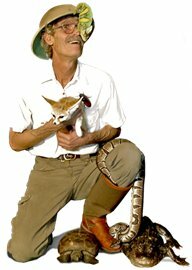 He specializes in reptiles such as snakes, alligators, turtles, wallabies, and exotic birds. Bwana Jim has a rare gift for handling animals and shares his knowledge in an incredibly fun and entertaining way. After the show visit the Wildlife Gift Shop where Thumper the crazy cockatoo will greet you. Find exotic animal t-shirts, nature CD’s, and stuffed animals. Book Bwana Jim’s Wildlife Show for your next birthday party, field trip, or reunion. The Wildlife & Nature Center is located 3 miles outside of Shinglehouse, Pennsylvania on Route 44, on the intersection of Wildcat Road.